Only in Britain. It’s a saying that you often hear when you read a newspaper story of see something on the news that reflects the oddities and eccentricities of British people. Take Lord Berners of Faringdon in Oxfordshire. Lord Berners eccentricities led to pigeons at Faringdon House being dyed, so do not be too surprised to see a dark blue or bright pink pigeon swooping around this corner of Oxfordshire. Something else that Lord Berners liked was the Faringdon Folly, a landmark hill that can not only be seen from some distance but also provides a great view itself. Dyed pigeons and follies are just two examples of Faringdon, a small town of just six thousand people. It’s not that unusual though, for just like the rest of the UK it is only a matter of time before it succumbs to the joys of the hog roast. If you live here and have an event or special occasion to plan, perhaps you should find out more about why a hog roast chef could be the perfect solution to your catering conundrum. After all, there are many good reasons why should you go down the hog roast route and contact us here at Taste the Cracklin. Hiring a hog roast for your event will allow you to serve your guests with great quality food, that they may not have experienced before. Okay, so maybe you have had some great events in the past and the food has been good. That’s great, but don’t you think a change would be good? It will certainly signal a change and one that your guests will be both surprised by and adore. It will be no surprise to the hog roast chef of course. They know that every hog they serve will be of a high quality, because the meat they choose is top notch whole pig meat from a trusted supplier, and when you start off with great quality meat, you invariably end up with a great quality meal. The whole new wave of love for a roasted hog is probably down to an increasing desire from British diners for superb fresh cooking using quality ingredients. With great meat being used, one box is already ticked and another one can be ticked courtesy of the fresh cooking, and when it is cooked before your very eyes, you know that it could not be any fresher. 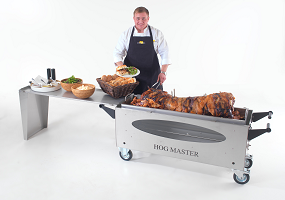 Seriously, the cooking process on the hog roast machine (which is impressive in itself) is a joy to watch and your guests will love watching as the chef carefully tends to the slow roasting whole pig. It’s a labour of hog love, too, for the roasting process takes six long hours, enabling the stunning flavours held within the meat to be release and mature. You won’t be watching for six hours as it will have started earlier, though with such incredible aromas coming from the slow roasting pig, you may wish you had been there from the start. So you already have quality meat on the spit, sending out aromas to die for and the added enjoyment of being able to see your meal being cooked before your very eyes. What more could you possibly from your catering? Well how about incredible value. We all know that Britain is not a cheap place to live, and in these tough economic times, it seems that the cost of living is soaring higher than a pink pigeon above Faringdon Folly. The cost per head of catering at special events can be a little alarming to say the least, so you may be tempted to either cut corners on the food or cut numbers (and hope you don’t upset anyone). Well, with hog roast, you don’t need to worry about either of those scenarios. It not only provides you with a stunning meal but it is incredibly affordable, too. That single whole pig that the caterer is carefully roasting away is going to serve upwards of one hundred people. That really is an incredible figure, and it’s going to mean your cost per head is driven much lower. Whatever style it is served, it’s really delicious. It’s a tender, succulent meat that has few detractors and many, many admirers. It’s a world away from the more boring options that are the sad mainstay of many an event and it will delight all your guests to eat as well as to look at. Now that can’t be bad!